The well-equipped and highly rated Touareg SUV just got a bit more sumptuous! VW has unveiled the stylish Touareg R-Line which is based on their Touareg Altitude – and that’s already got a decent spec level. But now the R-Line, which has some style differences to its fellow models, is chucking in extra gear worth £4,000 but only charging a £750 premium. That’s quite an impressive package with the R-Line sitting on 20 inch alloys along with newly styled bumpers and side skirts. The R-Line has an impressive panoramic electric sliding sun roof which runs the length of the vehicle (and I wouldn’t want to pick up the repair tab for it!) which makes the roomy cabin appear bigger and there is an electric-powered tailgate to help loading. There’s also keyless entry, nice leather upholstery, an excellent sat nav and audi system controlled via a colour touchscreen, Bluetooth and various other modern additions such as iPod holders and zonal climate control. The R-Line also has a stop/start system to help save fuel. For their £44,000, buyers will get an eight-speed auto gearbox which brings a decent performance from its 3.0litre V6 diesel engine for the 204 PS while the 245 PS will cost slightly more at £45,700. Meanwhile, VW is also dropping prices for its CC range. 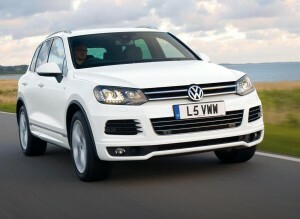 The German carmaker is reducing the cost in the range by £470 so the basic version now costs £24,050 OTR. Choose the top-selling VW CC GT 2.0-litre TDI 140 PS and you’ll save even more as the price falls by £1,320 because VW have made the Adaptive Chassis Control an £850 option. This entry was posted in 4X4 Car, Car Updates & Releases, Family Car, New Cars and tagged Adaptive Chassis Control, audi, audi s, car, climate control, diesel engine, LS, price, PS, R Line, speed, TDI, Touareg Altitude, touareg r-line, VW, vw cc, vw touareg, vw touareg r-line by Steve Lumley. Bookmark the permalink.